This second edition of Digital Optical Communications provides a comprehensive treatment of the modern aspects of coherent homodyne and self-coherent reception techniques using algorithms incorporated in digital signal processing (DSP) systems and DSP-based transmitters to overcome several linear and nonlinear transmission impairments and frequency mismatching between the local oscillator and the carrier, as well as clock recovery and cycle slips. These modern transmission systems have emerged as the core technology for Tera-bits per second (bps) and Peta-bps optical Internet for the near future. 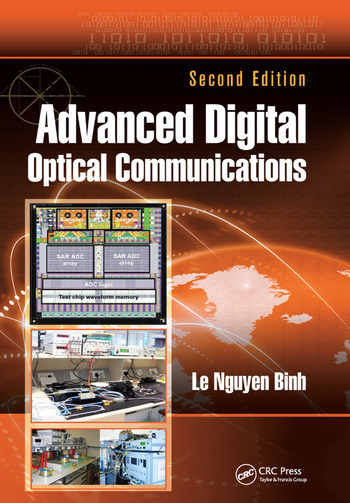 Advanced Digital Optical Communications, Second Edition supplies a fundamental understanding of digital communication applications in optical communication technologies, emphasizing operation principles versus heavy mathematical analysis. It is an ideal text for aspiring engineers and a valuable professional reference for those involved in optics, telecommunications, electronics, photonics, and digital signal processing. Le Nguyen Binh is technical director of Huawei Technologies’ European Research Center, Munich, Germany. He holds a BE (Hons) and Ph.D from the University of Western Australia, Crawley. He has authored and co-authored more than 300 journal papers and eight books, in addition to several refereeing conferences. Previously, he was professorial fellow at Nanyang Technological University of Singapore; the Christian Albrechts University of Kiel, Germany; and several Australian universities. He also served as Chair of Commission D (Electronics and Photonics) of the National Committee for Radio Sciences of the Australian Academy of Sciences (1995–2005). "This book is excellent and potentially can be used by many universities. … I have not seen that any books are better than this book in this topic." "The main strengths of the book are that it is comprehensive, covers the material in depth, and is up-to-date, covering topics which, in many cases, are still being actively investigated by the research community. It provides explicit guidance on the computer simulation of optical communication systems and is very accessible, being well structured and clearly written."